University College London (UCL) have invested in a 3D Systems ProX 100 direct metal printer from CDG who supplied the ProX 100 machine, PX Box, furnace, accessories and materials as part of a full turnkey solution. George Dwyer at UCL comments: "The ProX 100 printer installation and training took about 3 days, provided by the excellent 3D Systems engineers. The printer will be used to support robotics research at UCL, including surgical tool development, micro robotics and haptics, as part of an EPSRC capital equipment grant. Up to now we've been printing the tips of endoscopes for surgery which are around 5mm in diameter. The detail and dimensional accuracy of the printer has been incredibly impressive. The surface finish direct from the printer is a little coarse but the parts can easily be polished for a smooth surface." Image of the ProX 100 metal printer and PX Box in situ. Successful test prints were produced within a week of the machine being installed, as can be seen in the image below, noting the parts are printed on a metal build plate, then removed later as a separate process. Shining3D launches Evolution of Desktop 3D Scanners April 22, 2017 Shining3D, a leading global developer and manufacturer of 3D scanning, 3D printing and 3D software solutions has announced the formal opening of European Headquarters in Stuttgart, Germany. Shining3D EMEA will commence operations immediately with the launch a new generation of EinScan 3D scanners Shining3D EMEA, will provide a dedicated sales, support & innovation center for Shining3D’s products for the European, Middle Eastern and North African markets and is expected to solidify its sales activities, which have been handled exclusively by Shining3D distributors across EMEA. The company states that Europe is a strategic area in its plans to accelerate the introduction of its industrial, professional and consumer product into the global market. “Our innovative, world class 3D scanning and 3D printing solutions, including the new EinScan-SE and EinScan-SP models that we are now launching, have been globally recognized for their quality and reliability,” said Oscar Meza, VP of global sales. “With the opening of the new EMEA office in Germany, our goal is to build a solid sales infrastructure and provide our clients with qualified local customer support and advanced training capabilities.” The evolution of desktop 3D scanning The first products launched by Shining3D EMEA are the EinScan SE (Elite) and EinScan SP (Platinum) systems, which represent the evolution of Shining3D’s EinScan S desktop 3D scanner range. The EinScan S desktop 3D scanners enjoys a strong reputation among professional for high speed and accurate scans. These new models enable even faster single scans (under 4 seconds with the EinScan-SP version) and 360° scans (under 1 minute with the EinScan-SP version); with maximum single shot accuracy below 100 micron for the EinScan-SE version and below 50 micron for the EinScan-SP. Both systems also feature one-click uploads to third party data sharing platforms, with automatic alignment and automatic mesh generation. The scanners produce accurate 3D models which can be directly 3D printed, without the steep learning curve necessary for complicated 3D design software, by auto-meshing files to be watertight. For their graduation project at the Academy of Fine Arts in Warsaw, Poland, design students Zuzanna Gronowicz and Barbara Motylinska, visualized their concept for customizable 3D printed shoes. They’re made from eco-friendly materials and can be ordered using an app. ZMorph multitool 3D printer was used to create prototypes and plan the entire production pipeline. According to the research made by Anton Pieper, over 20 billion pairs of shoes is manufactured every year, mostly in Asia. One shoe can be composed of over 30 various materials, some of which are very hard or impossible to recycle. At the same time, up to 25 thousand liters of water is being used just to make one pair of shoes, which is a very high environmental cost. This data inspired Gronowicz and Motylinska to look for more eco-friendly shoe making tools and 3D printing proved to be one of them. When designing their customizable 3D printed shoes, their main goal was to make them recyclable but fully functional. At the same time, the users would gain the ability to decide how the shoes would look to make them more personal and unique. Using ZMorph multitool 3D printer, Polish students developed their own method of 3D printing objects directly on wool and cotton. It enabled them to create more flexible shanks and manufacture the whole shoe without gluing or sewing it together. At the same time, the textiles enable proper feet perspiration so the shoes are more comfortable to wear. Creating a light and flexible sole was also a challenge. Gronowicz and Motylinska came up with a parametric openwork structure that can be adjusted to fit different shapes of feet. At the same time, the structure requires less material in printing (with almost no support needed) while making the sole very durable. Both 1.75 mm Plastic Extruder and DUAL PRO toolhead for ZMorph multitool 3D printer were used to materialize this project. Single material printing proved to be successful for various types of flex filaments. Two-material extruder printed more intricate objects, shapes, and ornaments with soluble PVA support as well as added color gradients to them. Gronowicz and Motylinska also designed a dedicated app allowing users to design their own shoes. It’s still at an early stage, but the authors want to give their users the ability to prepare the printing files and save them for free, order a pair directly through the app or to search for a 3D printing workshop nearby. The project made by two graduates of the Academy of Fine Arts stands out with its eco-friendly attitude, but the ability to design and 3D print truly unique shoes are the most exciting part of it. Gronowicz and Motylinska continue to test and refine their idea for customizable 3D printed shoes and want to turn them into a business. We’re keeping our fingers crossed for their success! Przemek Jaworski of ZMorph has no doubt that multi-material 3D printing technology of Fused Filament Fabrication will continue to grow in coming years. It’s the least expensive method of 3D printing, and it offers vast material base, that keeps expanding every year. Many of these new challenges will be won by using advanced software, which can be a game-changer, despite technological limitations. ZMorph are experimenting with this a lot. 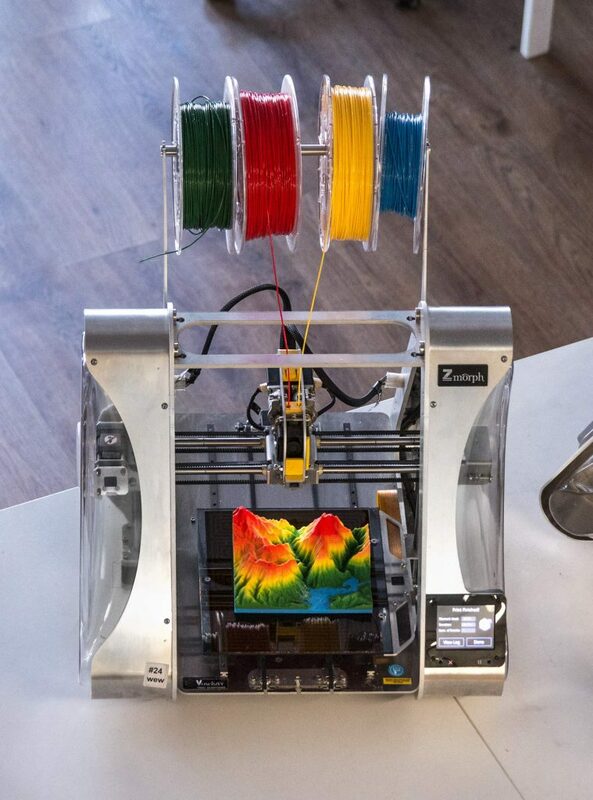 Recent updates to the Voxelizer software allowed our two-material DUAL PRO extruder not only to blend filaments but also print colorful images on 3D objects, which they call Image Mapping. It gives existing users a completely new functionality and provided a competitive advantage for attracting new clients. ZMorph 4 material printing. Photo via Zmorph. Another upcoming feature is a set of special tools and 3D filters for architectural models production – totally relying on clever algorithms for no-support printing of floorplates for example. New dedicated software is a factor that can’t be ignored – and will be crucial for pushing the limits of 3D printing, as the hardware in most machines offers similar technical capabilities and is not progressing much more. First of all, multi-materiality opens new possibilities in rapid prototyping, which still is the most common application of 3D printing. Although it’s already possible to combine materials in two-material extruders or experimental four-material ones, we’re still a few steps before the quality reaches its full potential (also thanks to a dedicated software). Multi-materiality in desktop 3D printing will thrive once it enables a truly high-quality material blending of various filaments. Creating prototypes that include hard and flexible parts within one print is possible with expensive industrial machines. As it becomes achievable with a desktop 3D printer, the technology gets more accessible and affordable to a greater number of professionals and unlocks their creative powers. Colour blending and full-color FFF / FDM desktop 3D printing will also improve and become an industry standard. This will only broaden the possibilities and enable new professional applications. CDG are the UK distributors for Zmorph. Dirk Dombert, VP of Sales at Cimatron, 3D Systems, is pleased to announce CDG as the sole partner for Cimatron software in the UK. Cimatron™ software is the leading CADCAM solution for Mould & Die Design including NC programming. Cimatron imports CAD files from all the leading CAD packages, as well as formats such as STL. The core software engine uses a modern parametric model tree for hybrid modelling using B-Reps (fast and interactive boundary representation coding). The tool design is highly automated for maximum productivity. Cimatron 13 includes many new features and capabilities such as:- • A fully redesigned user interface that is faster to use, and easier to learn and customize; • A broad range of new CAD for tooling functionalities for faster design, including direct modeling, new mesh operations with hybrid modelling capabilities and enhanced assembly functions; • Boosted drafting capabilities including the dynamic creation of multiple views and the ability to create shaded views; • New mold-design applicative tools including gates design for a more streamlined design process and conformal cooling tools for the easy design of Cimatron™ 13 features a new user interface that is faster to use and easier to customize; • Separate environments for progressive- and transfer-dies for quick design of any die type; • Smart electrode mirroring tools and hybrid design environments for accelerated electrode design with automated solid tools; • A new plate machining solution that provides a complete set of capabilities for fast, efficient and automated programming of mold- and die-plates; • New measurement on CNC machines to define the measurement probing cycle in the NC environment, allowing validation of the machining process while the part is on the machine; • New and improved NC programming capabilities for milling and drilling to boost programming automation in rough, finish and 2.5 axis operations; • Concurrent design and manufacturing environment, enabling multiple users to work on the same project simultaneously. Wing mirror case weight reduced by 53% thanks to Omni 3D printing! Mirror caps, air vents – these are just some of the parts printed by OMNI3D for Arrinera Technology S.A. All models are printed at a full scale, mostly with ABS-42 and are used as functional prototypes as well as final parts. In this particular case, the challenge was to reduce the weight of the mirror case. In the automotive industry weight is one of the most important aspects. The company was looking for the best solution to produce car parts which are durable and at the same time – as light as possible. Parts are printed on a 3D printer – Factory 2.0 Production System using ABS, ASA, PC-ABS, PET-G, HIPS filaments depending on the requirements. ‘Parts printed in 3D on Factory 2.0 Production System meet all of our requirements – both in terms of strength, dimensional accuracy, turnaround time and weight loss. Many elements are installed in the car as the final products,’ – Łukasz Tomkiewicz, Managing Director, Arrinera Automotive S.A.